We are writing to inform you about a pathetic kind of serious human rights threat against pro-democracy Thais residing both in Thailand and abroad. We would also like to ask you to punish the perpetrators at least by never granting visa of entry to your country. This letter is also endorsed by concerned citizens whose name(s) and signature(s) appear at the end. 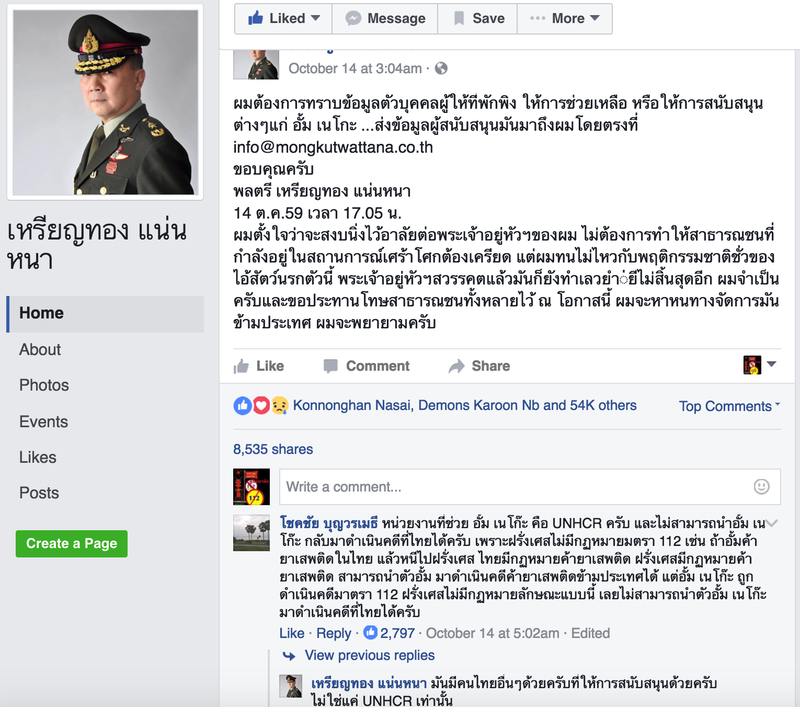 Maj Gen Dr. Rienthong Naenna, creator and leader of an organization set up to destroy the anti-lese majeste dissidents, witch-hunt movement among royalist Thais worldwide under the Facebook page name "Garbage Collection Organization." To a competent linguist, the provocative term "garbage collection" gives a connotation of "getting rid of" or "destroying" or, to the most radical degree, "using violence to suppress or murder" the people who criticize the Thai monarchy. 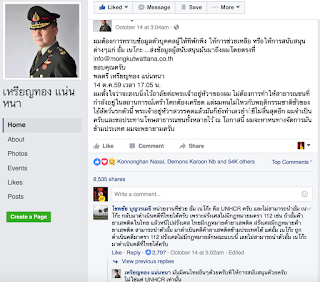 A retired military commander and director of a hospital, Rienthong has been using his networks of royalists to create and spread hatred, anger, and vengeful sentiment among themselves so as to lead to oppressive, abusive, and possibly fatal acts of witch hunting worldwide. You can see a list of evidence of this lunatic royalist's dangerous and rights abusive acts from this link: http://tahr-global.org/?page_id=21917. His most recent act that inspired this letter involves his announcement that contains names and photographs of pro-democracy and anti-lese majeste Thais residing in foreign countries and that also urges royalists from around the world to report to him by email the "physical addresses" of these individuals, including the Chairman of the Board of Directors and the Executive Director of the Thai Alliance for Human Rights. As much as the Thai lese majeste law is an oppressive threat to freedom of expression, academic freedom, freedom of speech, and other judicial rights, the person like Rienthong is highly dangerous and condemnable, especially now in the era when terrorist acts are becoming more of a threat to innocent citizens in many civilized countries, and he must be made to realize that what he has been doing is seriously wrong and unacceptable by the international standards. We propose that Rienthong and the people associated with his wrong deeds be blacklisted from entering your country forever. Unless this matter is taken most seriously, the acts by Rienthong and his radical networks of royalists worldwide could lead to more of sad stories. Your measure to counter this inhumane mentality is, hence, critically important.